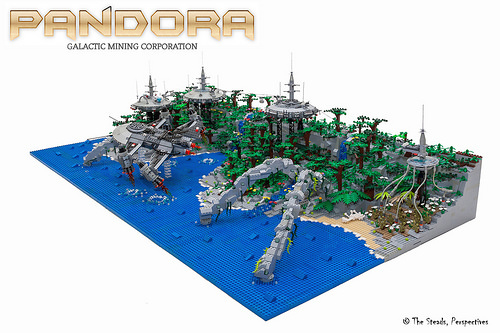 Jon & Catherine Stead have built an enormous Avatar-themed diorama depicting a future for Pandora where low-impact ore extraction has become a reality, with humans and Na’avi working together in harmony. The layout is 3m x 1.5m — a huge undertaking, which the builders have managed to stuff full of detailed plant life and mining machinery. Jon says the model took 6 weeks to complete — you can see why! Sadly there are no separate close-up images, but I’d heartily recommend clicking through to the image here and zooming in to see some of the details.